The reduced mass calculator allows you to obtain the reduced mass of a two-body system, a very useful physical value that helps simplify the two-body problem so that it becomes much easier to find the equations of motion for such a system. Reduced mass is a physical quantity used when solving the two-body problem to turn it into an equivalent one-body problem that can be solved faster and easier. The complexity of the two-body problem arises from the fact that the movement of one-body affects the other which in turn affects the first one... in an endless loop of additive effects from one-body to the other. A typical example of a two-body problem is that of two objects of comparable mass orbiting each other. Using the reduced mass, you can decompose the two-body problem into 2 one-body problems that are much easier to solve. One of these one-body problems would describe the movement of the center of mass, while the other would describe the relative motion of the two bodies with respect to the center of mass as it is described on Wikipedia. Once the problem is solved, the distance, position and other physical quantities of each system can be calculated using, for example, the gravity equation calculator. The usefulness of the reduced mass calculator is not limited to gravitational problems since any two objects orbiting each other (due to any kind of force) constitute a two-body problem that can be simplified and decomposed by means of the reduced mass. Such other problems include some of the most known problems in physics such as the (semi-)classical solution for the hydrogen atom and other planetary-like systems. 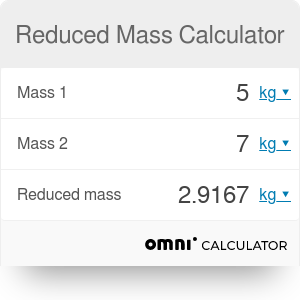 The reduced mass calculator is a very simple calculator and is composed of three different parameters, as we have seen in the reduced mass equation above. Let's see what they mean and use the example of the Earth and the Sun to illustrate possible values. m₁ Is the mass of the first of the two objects that appear in the two-body problem. For the Earth that is 5.972 × 10²⁴ kg (or 1 Earth). m₂ Is the mass of the second of the two objects that appear in the two-body problem. For the Sun that is 1.989 × 10³⁰ kg. Mred, also called &mu;, is the reduced mass of the system. In the two-body problem of the Earth and the Sun it turns out to be approximately the mass of the Earth due to the big difference in mass between the two bodies. Due to the properties of the formula to calculate the reduced mass, m₁ and m₂ are interchangeable, and the Mred is always smaller than or equal to m₁ and m₂. Reduced Mass Calculator can be embedded on your website to enrich the content you wrote and make it easier for your visitors to understand your message.